The second TR1 built, this is the car qualified by Keke Rosberg for the South African Grand Prix and subsequently driven to victory in the International Trophy at Silverstone. At the end of the year this car, along with its repaired sister car, were sold to Italy for use in the Aurora Formula 1 Series. They were seen in testing but not raced in period again. 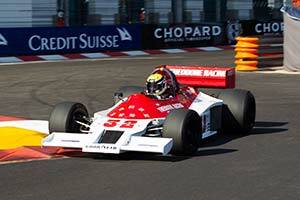 This car was eventually restored and re-appeared at the 2008 Monaco Historic Grand Prix. Now in British ownership, it has made regular appearance at historic events all over Europe.